You are Here: UniPay Gateway > FAQ > Can UniPay help with a collections software package? While UniPay gateway is not a fully blown collections software package, it does provide a lot of the traditional collections functionality. Among its features are: general infrastructure for account management and receivables aging, support for various account import formats, integrated skip tracing and payment processing for high risk merchants, seamless integration with print houses and credit bureaus and many more. 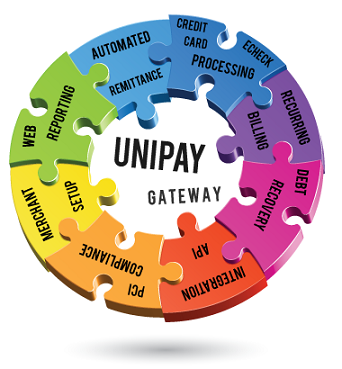 The true strength of the UniPay gateway as a debt management software package is in its unified and integrated architecture between recurring billing functionality and debt collections logic. Since both modules are part of a single solution, it is possible to quickly move an account to collections, formally handle the collections process and upon successful payments or settlement immediately reinstate the account to continue standard recurring billing process. The reinstatement approach is welcomed by many collections companies (as well as their clients), because it allows turning a win-lose situation into a win-win solution. Real-time delinquent account reinstatement is one of the key collections software features of UniPay gateway. FAQ: Can UniPay help with a collections software package? Your payment gateway questions answered by our team. Answer to a commonly asked question whether UniPay Gateway can help with a collections software package.